We ended up spending 5 days in La Paz, which is 5 more than we originally planned when we first started dreaming up this trip. The city looks really interesting – almost a bowl nestled among mountains. 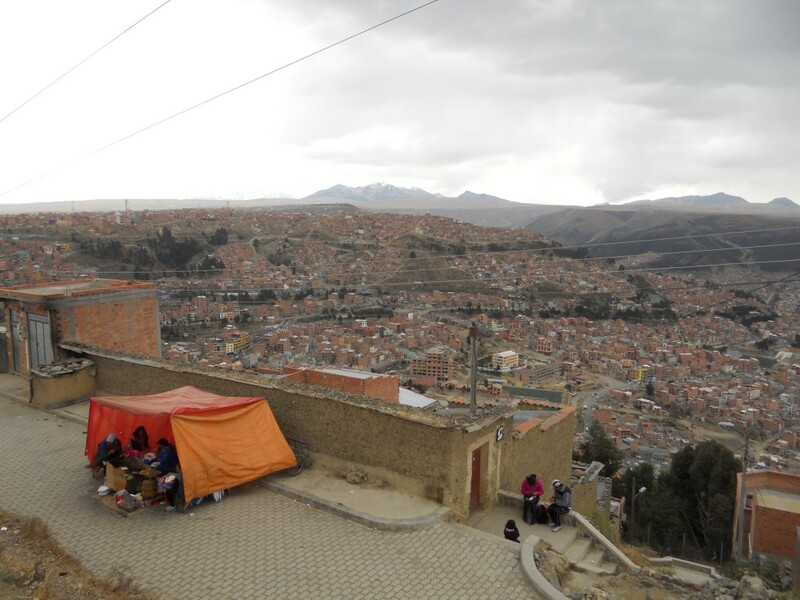 The altitude really varies – if you are in the bottom, it’s around 10,500 feet but the houses climbing up the sides could be almost 3,000 feet higher. 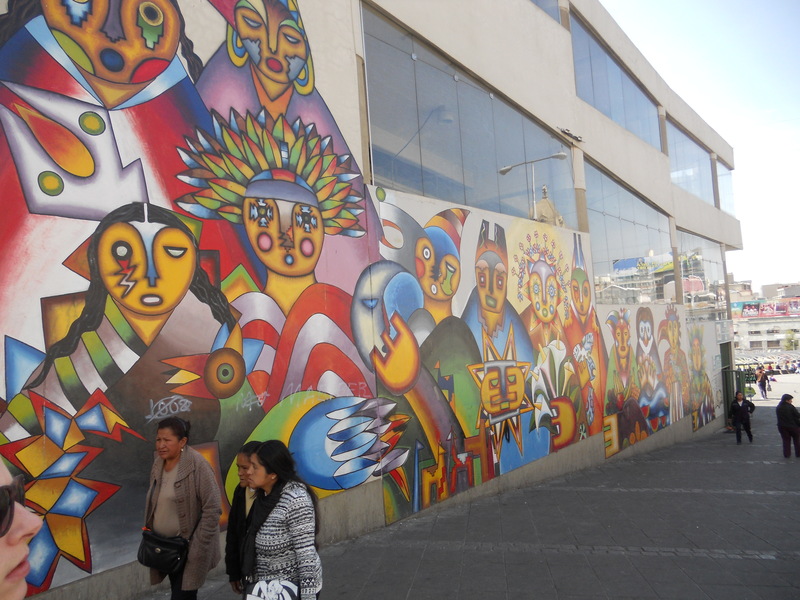 We spent a lot of time just wandering around La Paz. 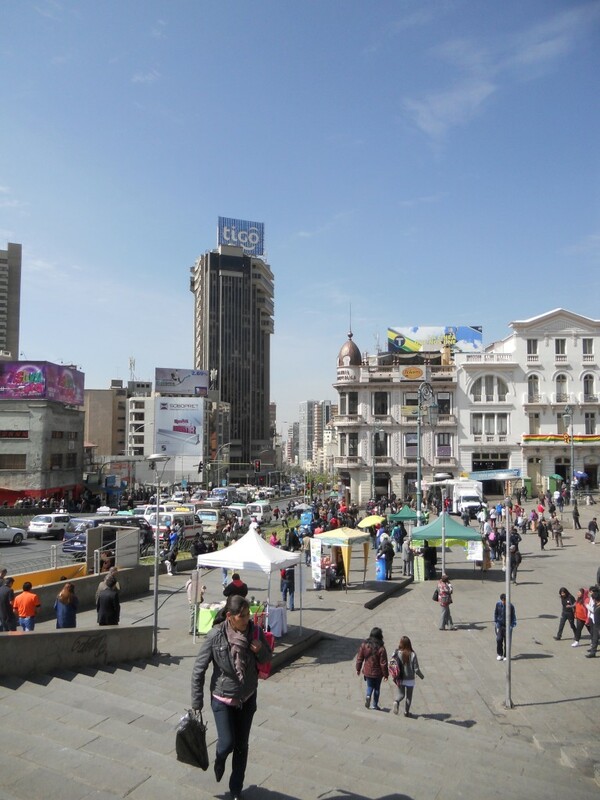 The city was a lot more densely populated with buildings and people than I had imagined it would be. 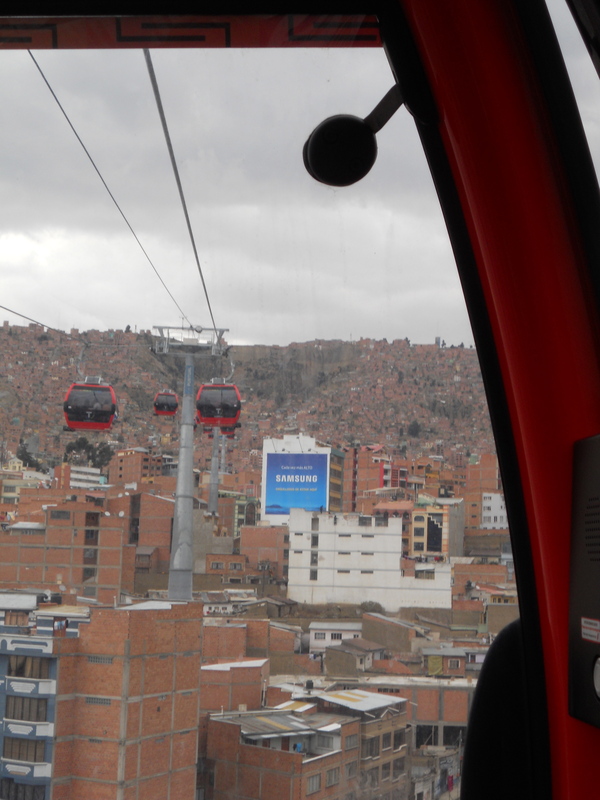 We took the teleferico up to El Alto (the city that is on the top of the bowl) to check out a huge flea market. The market is supposedly one of the largest in South America – we wandered around it for an hour and a half and never saw an end. It had a very random mix of items from tires to computers to clothing. 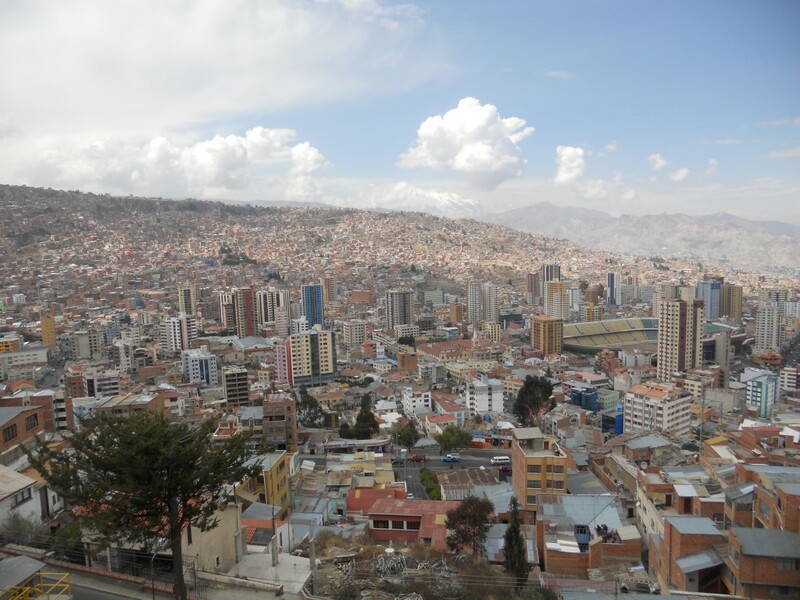 The view of La Paz from El Alto was pretty cool. 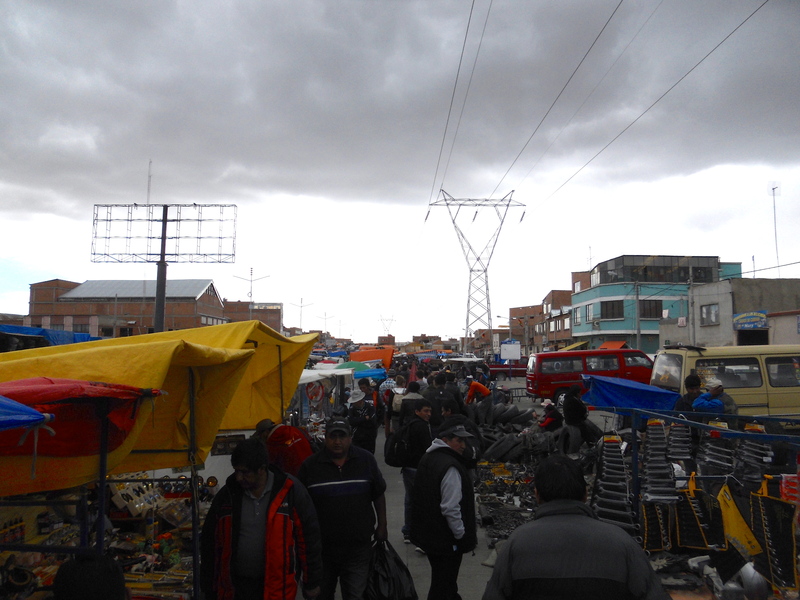 There was another market right by our hostel that we ate at several times. 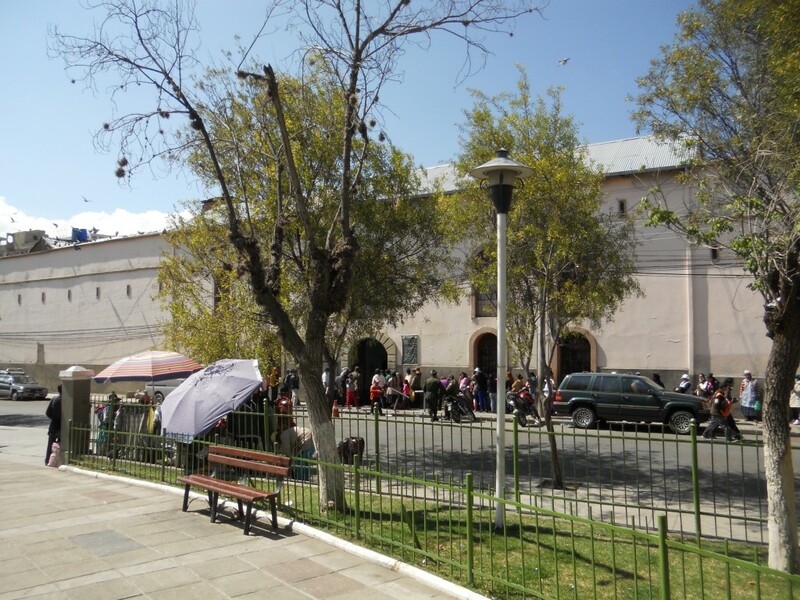 It was a huge concrete building filled with tiny stalls with vendors selling food, flowers, groceries, etc. The little restaurants were so small that you were a foot away from the cook/owner. 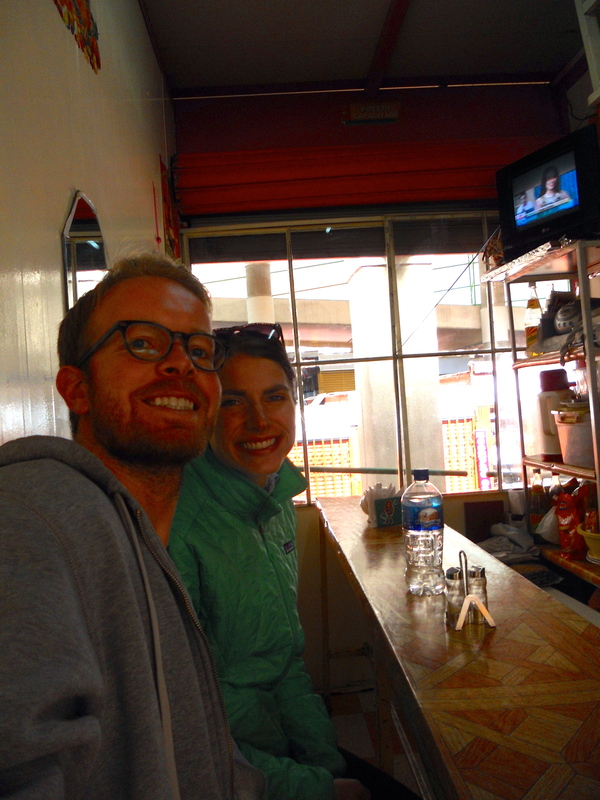 The food was really cheap – almuerzos (soup + main course) for $1.30 and giant fruit salads for $1.15! 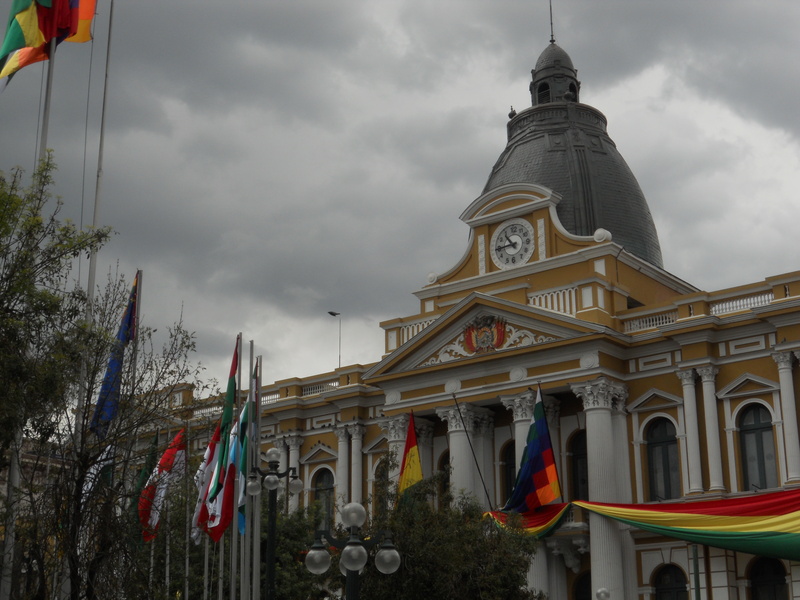 We did a city tour one day that started outside San Pedro Prison. Apparently there is going to be a big Hollywood movie based on a book about the prison called Marching Powder starting to film soon. 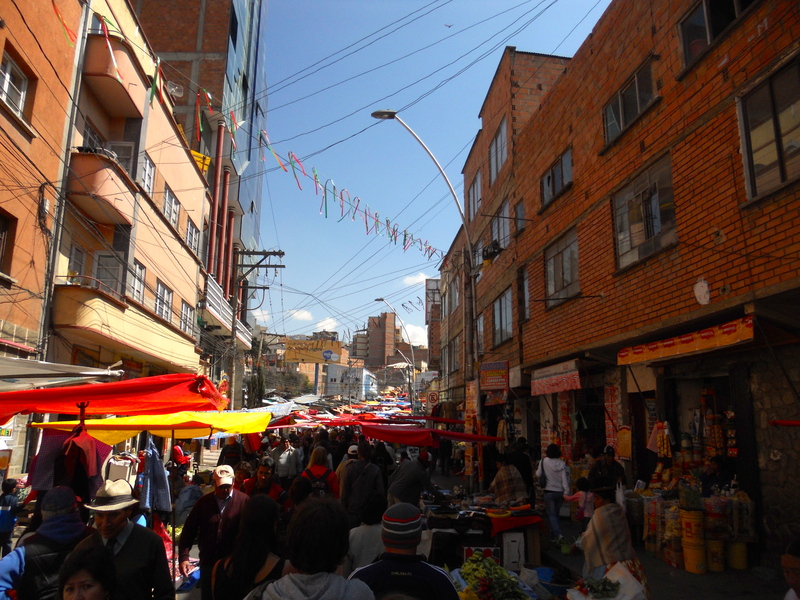 We also went to another outdoor market (so many markets in La Paz!) 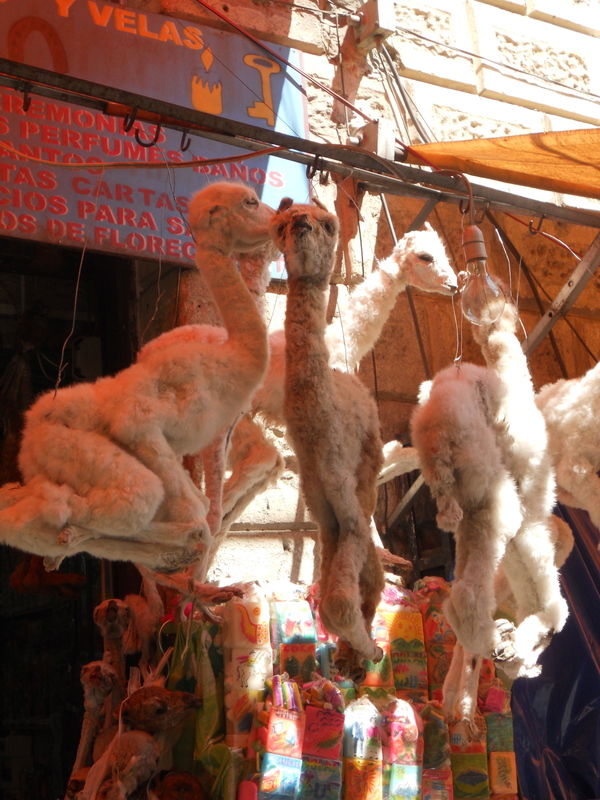 and a “witches market” where you could buy llama fetuses. 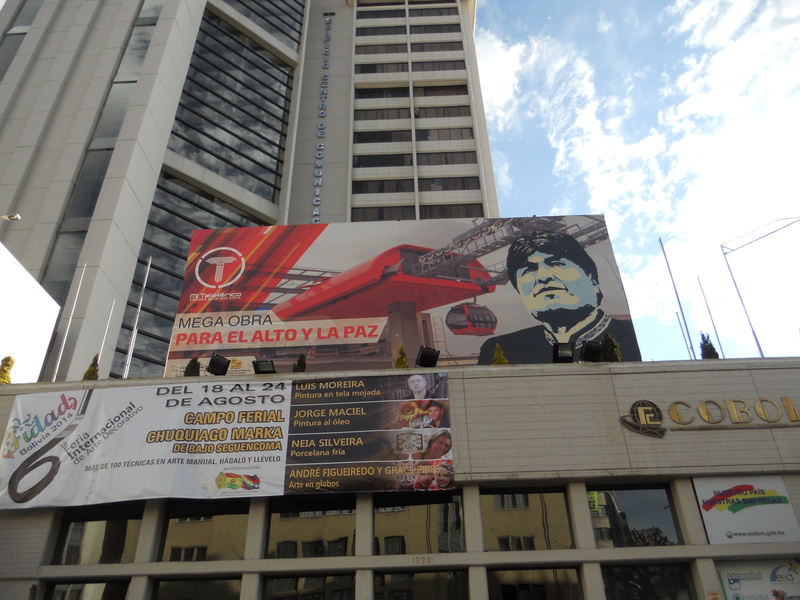 La Paz is the highest capital in the world so we saw some government buildings (with backwards clocks) and I can now recognize the president of Bolivia – his face is everywhere! 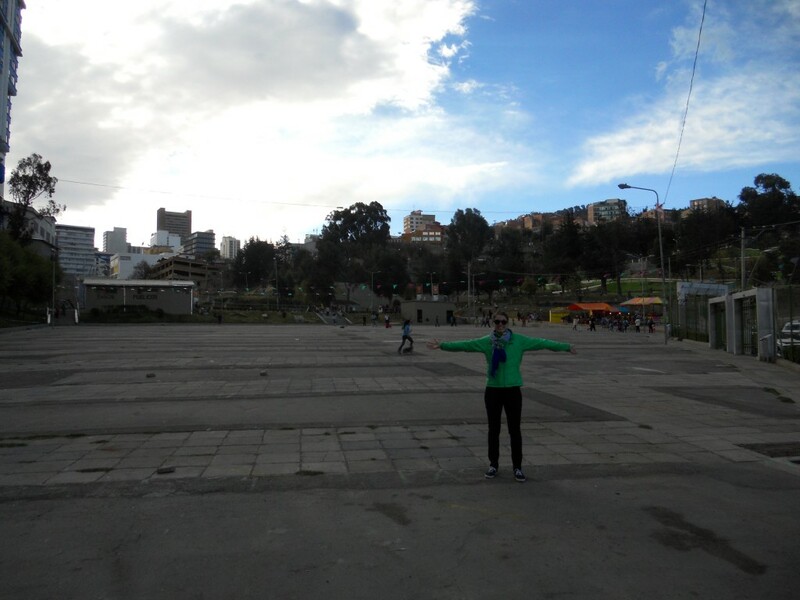 The last day we were there, we saw what looked like a huge park on the map in the middle of the city. 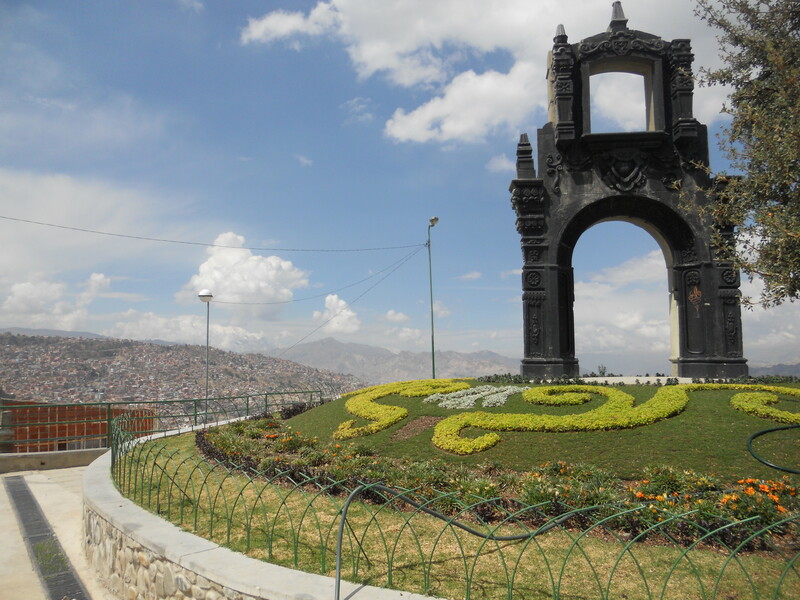 So we walked over only to find a huge park – but it was mostly cement!